What if You Could Attend College, for Free? Paige Davis, left, and Haylie Prottsman, make brooms to pay for school through their labor assignment at Berea College in Berea, Kentucky. Paige Davis: When I saw my job assignment I was like, ‘Broomcraft?’ My mom says, ‘It’s a cult, you are making brooms!’ So, I’m just like, ‘OK.’ But, I actually like it. It’s just like the best job ever. And, I have a really great boss. This is what we’re doing in our college to keep the traditions strong. We don’t have that much money. So a free education was a big deal and having room and board as well. I chose to come here because everything was paid for. So this is really nice. You get a computer. It’s hard to get in, but it’s worth it. If we have more free colleges, I’d bet a lot more people will go. Haylie Prottsman: I came over here because I wanted to learn a new craft and some of my friends worked here too. Making brooms, it sounds strange or off, but it’s really actually fun and it’s very creative and it lets you put your own style into a craft that you made. I’m from Franklin, North Carolina. It makes me proud and I’m really honored that I got into this college because it’s tougher to get into. And I like the message that stands behind it and what it stands for – equality and equal chance. I believe everybody should be treated equally and we should all get a chance to do the same things. Paige Davis is an 18-year-old freshman from Huntsville, Alabama. The biology majors plans to be a pediatrician. Haylie Prottsman, 20, is a native of Franklin, North Carolina studying biology and pre-veterinary medicine. Christopher Robbins, 32, leads the students in broomcraft at Berea College. Christopher Robbins: Broomcraft has been here since 1920. It got started because one of the college presidents decided there needed to be a job for the men during the winter. At that time the men were bricklaying, they were farming, things like that. We employ about 10 students. They work 10 hours a week and we do about 150 brooms a week. We make everything from cake tester’s, which is just a tiny broom, to full size sweepers. A cake tester is an old thing. You’ve probably seen your grandmother go over to the corner broom pull the straw off and test her cake to see if it’s done. This is just a cleaner way to do it and you don’t have everyday dirt on it. Some of the styles have been around since the 1920s and some of them are new things that me and my students have tried and came up with. We do different styles and colors. There’s only so much you can change — a broom is still a broom. 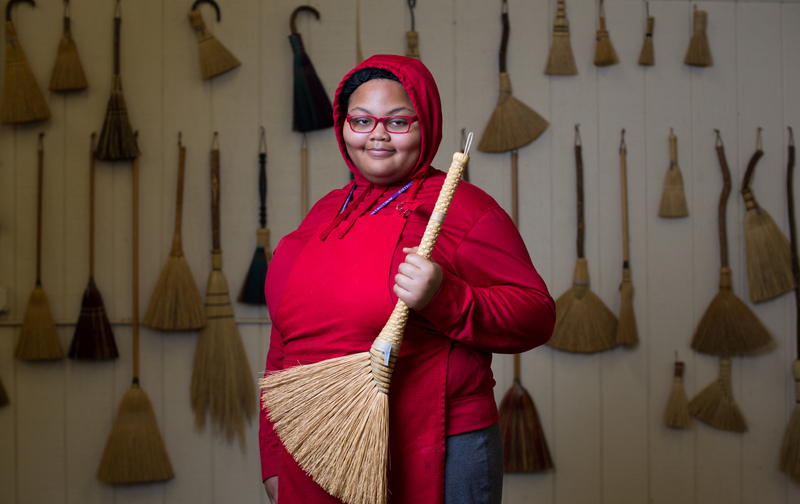 Some students will surprise you in the first broom they do — you’re shocked and you can sell it. Some people struggle with it for a whole year. It just depends on the particular student, if they’ve done anything with their hands with their artistic, ear — they were in band — it makes a big difference because they’re a creative person that can multitask. That makes a huge difference. I had a student several years ago who had never used a hammer. I’m like, ‘OK how did you survive 18 years and never used a hammer?’ She was not getting it at all. So it took a little longer, but she ended up making beautiful brooms and she worked for me for four years. Broomcraft supervisor Christopher Robbins, 32, has been making brooms since he was 14. He grew up in Rockcastle County, Kentucky. Benjamin Butero’s labor assignment placed him in the college’s central plant servicing HVAC units. All students at Berea are guaranteed a tuition-free education and all students must work. Ben Butero: My main primary position is for the central plant. It’s HVAC maintenance, so that includes all sorts of things all around campus and all the properties, working on dorm air conditioners and things like that. The labor program itself, I think it’s great. I’m working for the school, but they’re not only giving me an education, they’re giving me a trade. We’re all learning something. We may not be learning a trade, some people may be using a weed eater all day, but they’re learning a work ethic, workplace experience and working with other people and all of that. It’s hard. It’s a difficult school both academically and just managing time with the labor and the schoolwork. But the thing is it’s very much worth it. Just to persevere for the four years — get through it, you’ll be better for it and you’ll learn a whole lot and have a whole lot of experiences both academically and just in life. I’m getting an education with no strings attached, which is awesome. Ben Butero, 20, is a sophomore majoring in technology and applied design and studio art sculpture. He is from Madisonville, Kentucky. Taylor Styles is assigned to weaving for her labor assignment. She makes throws and blankets for sale by the school. Taylor Styles: I ended up in Berea because I want to expand on my education and I didn’t have the resources to do that in my hometown, including finances. So Berea offered that opportunity to me. My job is to come in and produce these products for crafts to be sold into the stores. But it doesn’t stop at making a craft itself. It’s learning teamwork. It’s learning skills. It’s learning critical thinking. If something happens to the loom, I need to be able to step back and think, ‘OK based on my experience I can solve this.’ Those are all skills that you use in the real world. The mission of the college is to educate students so they can leave with a set of skills and they can raise the next generation to not be in poverty. Berea College is about breaking the cycle of poverty and breaking the cycle of lack of access to resources because of financial reasons. There are a lot of people in the Appalachian region that struggle with finances. Poverty rates are pretty high and education, quality of education, may vary based on where you go. So being able to come to Berea and get a different perspective, because a lot of people don’t leave the mountains, to get a different perspective on the world and realize that it’s not this bubble. You can learn other ways that you can be introduced to different cultures. That’s something that’s also very important. And Berea has taught me that. The Appalachian region, at least where I’m from, is predominantly Christian, and being exposed to different religions, for example the Islamic religion — we have a lot of stereotypes and a lot of misconceptions beliefs back home. But coming to Berea, I have met so many people and learned so much through my classes here that completely washed away all those misconceptions and helps me realize that’s just a different culture and that’s how they believe. I still identify as Appalachian — just because I learn or experience these different cultures doesn’t mean that I lose who I am. I do intend to get back home. There’s a lot of services that are needed. And teaching is a career that isn’t very highly paid or sometimes highly recognized, but it is a career that is very rewarding in the sense that you have those students — that next generation that you’re going to influence to go on and to do something better. Taylor Styles is a senior majoring in art and education. Her concentration for art is in ceramics and in education it’s K-12. After she graduates she plans to return to her hometown in Spruce Pine, North Carolina. Fireside Weaving Studio Supervisor Amy Judd sits at the fly-shuttle loom where students are making blankets. Amy Judd: Most of my students are not art majors. So when they come here they’re learning a totally different craft that they’ve never done, someone in their family’s never done it either. So for them, it’s a different way of connecting with themselves. Some of our designs are simple enough for a new person to weave because at the most I would have a student is four years. So it’s not a long time to train somebody. We have a huge Internet business. So the students learn all of that, then they understand that some days they’re tired of weaving one color, but that’s what I need because that’s what’s selling. So we’re actually producing for customers. They need to understand they have to make money if they’re going to continue as a craft person. You can’t make something and not be able to sell it. You have to know how to sell it too. So I think part of the craft work is not only just weaving, it is also learning how to market yourself and your product. I think there’s a connection between the artist to the person buying it. And so that’s actually helped us produce and keep crafts. With a lot of people, it’s just having something that’s American made. We’re trying to get more jobs in the U.S.. I try to buy American made yarns. When tourists walk in and they see us actually making it, people really connect with that because they have a story to tell people. I think people are trying to find more of a connection with an artist. I think Berea has a brand and I think that’s important because we’re also not just selling our craft we’re also selling the fact that students are doing their education through working. Amy Judd, 52, is the Berea College Weaving Supervisor. She teaches weaving and employs 13 student weavers and 3 student seamstresses at the Sunshine Ballard Cottage. Founded by abolitionists in 1855, Berea College was the first interracial and coeducational college in the South. The school, one of seven “Work Colleges” in the country. Students attend tuition free, and all students must work. Located in Berea, Kentucky, the liberal arts college primarily serves its home state and the Appalachian region. 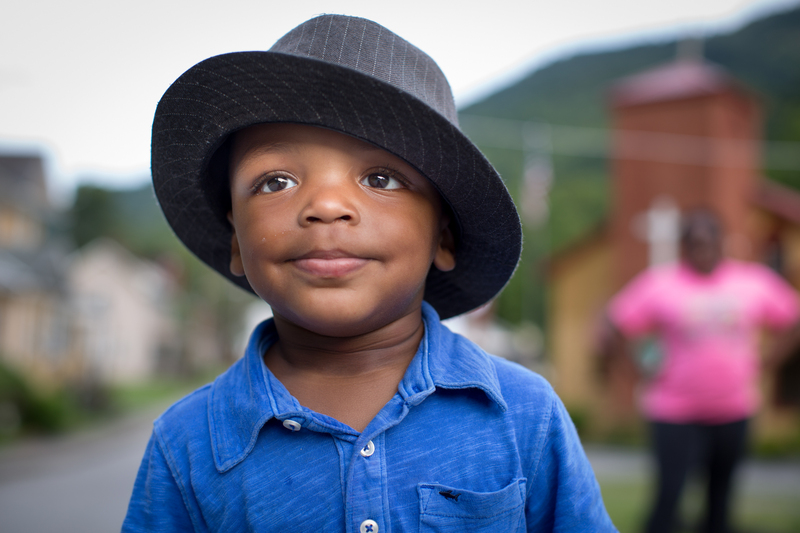 At age 2, and living in Lynch, Kentucky, Jakari Tinsley has his life in front of him. “I hope he grows up and goes to college and gets an education. Whatever he wants to do I will follow him and support him,” his mother said. Lynch was founded in 1917 as a U.S. Steel mining operation. At its peak it was home to more than 10,000 people, but now in 2017 less than 700 live within its borders. 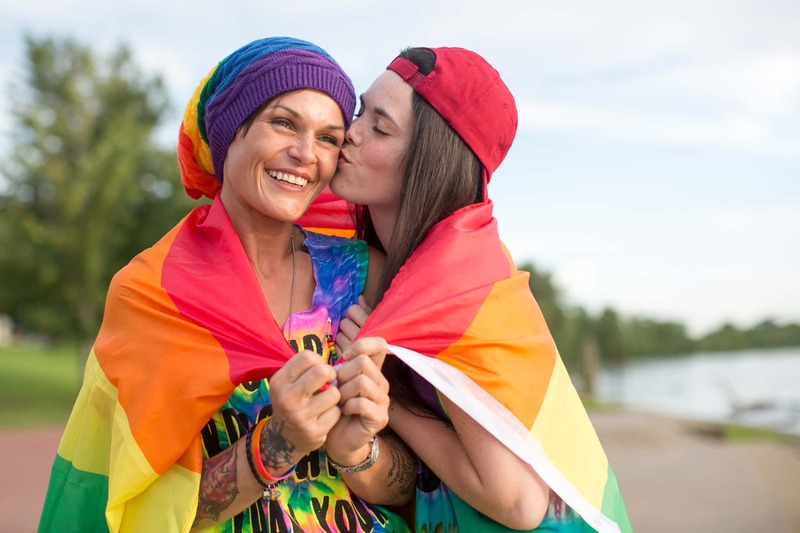 Melinda Tober, left, of Windsor Heights, West Virginia came to Pride with Kael Thomas, and Chelsea Camcho of Virginia Beach, Virginia. “I’ve been out and proud since 2010,” said Tober. 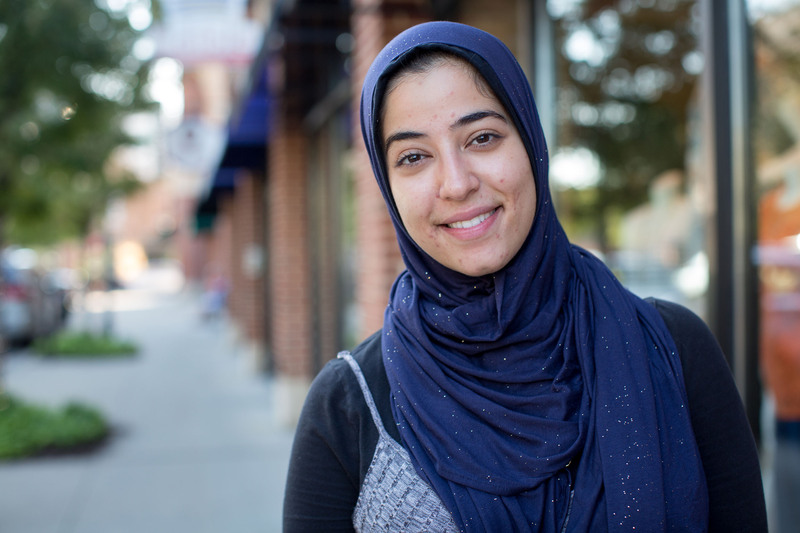 “It’s always looked down upon — so hush, hush, “ she said, explaining that she believes the event such as this help to increase awareness and reduce hate crimes. Hailee Parker, lives in Williamstown, West Virginia and grew up in Wheeling. She came to the event with her sister, Brittin Orum who lives in Wheeling. Parker performs as “Donte Dickles”. Miranda Thompson with daughter Ava Thompson, Terri Laquaglia, with daughter Regan Laquaglia and Maddie Crum attended the first Ohio Valley Pride together. “We care about people and we know that no matter what that person thinks about us – underneath all their hatefulness there could be a good person. ” – Ava Thompson. Landen Menough, of Martin’s Ferry, Ohio (stage name Miss Rilee Rae Michaels) was emcee of the event. “If you leave here with one thing today, leave knowing that you are all family to me. You pick your own family and your family are the ones that accept you to no bounds of the earth.”— Landen Menough’s message to the crowd. Andrew Vargo has lived in Wheeling, West Virginia all his life. Jordan Sewell, aka “Xenus”, performs for the crowd at Heritage Port. Jordan Sewell, with his mother, Rauslynn Platt as she films the performances. They live in Bridgeport, Ohio. Editor’s Note: This article has been revised to correctly reflect that Jordan Sewell lives in Bridgeport, Ohio.